● Misubishi PLC combine with Proface human / machine inter face LCD touch screen control. ● Japan made 5-phase stepping motor and driver (Oriental). ● Stainless steel frame construction is standard. ● Labeling speed is automatically synchronized with conveyor speed to ensure quality labeling. ● 50 job set-up can be stored in memory for easy recall. ● Conveyor driven by variable speed in memory for AC motor (Siemens brand). ● Simple adjustments with coupled moement design of two labeling heads with easy access. ● Hot Foil Printer for date-coding. 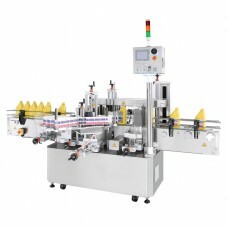 ● "Push & Press" optional attachment is used to ensure smooth labeling without wrinkles or bubbles. ● Tapered products can take advantage of the "Labeling Heads Angle Adjustment" up to 15 degree for conforming to the product shape. ● Product separating screw for high speed labeling. ● LRD-6110 Lion Sensor for transparent labels. ● Servo motor for high speed labeling.